To study the clinical features and associated risk factors of interstitial lung disease (ILD) in clinically amyopathic dermatomyositis (CADM) in Chinese patients. Forty-one Chinese Han patients with a diagnosis of CADM in West China Hospital from August 2008 to 2011 were retrospectively analyzed. The prevalence of ILD in CADM patients is 60.98 %, in which 26.83 % for acute/subacute interstitial pneumonia (A/SIP) and 34.15 % for chronic interstitial pneumonia (CIP). Mortality of A/SIP is 63.64 %, with a 6-month survival rate of 54.50 %. 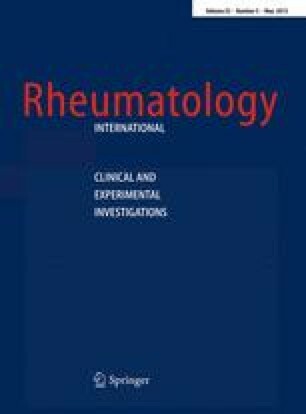 Levels of erythrocyte sedimentation rate, serum ferritin, alanine aminotransferase, aspartate aminotransferase, creatine kinase, lactate dehydrogenase, hydroxybutyric dehydrogenase, and immunoglobulin A (IgA) are higher in CADM-ILD patients than CADM patients without ILD. Levels of serum ALB and lymphocyte count in peripheral blood are significant lower in A/SIP than in CIP group. Sign of ground glass opacities in high-resolution computed tomography (HRCT) images is more common in A/SIP group, and diffusion function is worse in these patients compared with CIP group. The prevalence of ILD in Chinese CADM patients is strikingly high, and A/SIP is a major cause of death in CADM patients. Laboratory findings combined with HRCT examination and pulmonary function tests can provide valuable predictive information of ILD or A/SIP in CADM patients. Yuechi Sun and Yuan Liu contributed equally to this study. The work was partially supported by NSFC (Natural Science Foundation of China) grant 30830094, 30972678 to Dr. Guixiu Shi and 30801028, 81172870 to Dr. Bing Yan.